I think, I feel, I believe…A pronoun and a verb that can only mean one thing: the person speaking is about to give you their opinion. I wish I had better news for all of us, but a belief is just something we wish to be true. We hope that it is true. But, the truth is that it is based on our experiences and our opinions that are filled with brain biases and inaccuracies. Unfortunately, the football world is full of opinions, but scarce on facts. When someone issues a statement that is based on their judgment, their point of view, or their opinion, that is called being subjective. When someone says something that is based on facts; that is called being objective. Subjective. Subjective. Subjective. 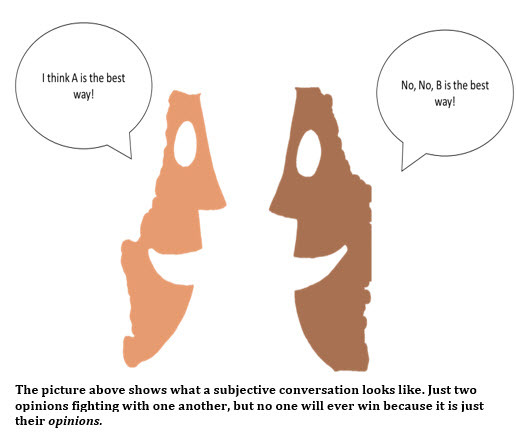 Subjectivity means that someone is just giving you their outlook, or their expression of opinion. But, these statements are incredibly biased, based on assumptions, beliefs, and are completely non-verified. In football, people develop concepts based on subjectivity, assumptions, experiences, and opinions. Coaches that develop concepts, or ideas, based on subjectivity are creating nothing more than the flavour of the month. So, how do we avoid this as football coaches? We must take a philosophical starting point. We need to start with objectivity. We don’t start with somebodies opinion because why would one opinion be any better than the other? Objectivity completely eliminates any subjective perspective by following a process that is purely based on the hard facts. Objectives are concepts that are based on principles, rules, and absent of bias. They are universal concepts that apply to football coaches everywhere. They aren’t influenced by where you are from, what league you coach in, or what courses you have done. They apply to all of us because we all coach and play the same game. Now, does this mean that our experiences and opinions are useless? Well, yes and no. They are when we try to force our opinions on others as if they were double-blind research backed facts. But, if we use objectivity as our starting point first, then our opinions, experiences, and perspectives have meaning. It is only when we have developed an objective starting point and reference that we can begin to subjectively apply the philosophy. The goal is to subjectively apply an objective reference. The goal of this article is to add to the objective reference created by Jed Davies most recent book, The Philosophy of Football: In the Shadows of Marcelo Bielsa. After having gone through the book for, I think, maybe the 4th time, I am ready to expand on his work. We are two men in search of something very similar: objectivity. I don’t care much for subjective conversations about how you think the game should be played. I try to avoid subjective conversations about what you prefer as the best training methods. Subjectivity is your personal application of something, and what I’m interested in is what that something is. What guides your application? Too often, people are subjectively applying from nothing. They follow no manual, no model, no objective philosophy to guide their thought processes – they just simply apply. Jed has tried to make the attacking moment of the game objective. Instead of writing articles about subjective zones on the pitch, and arbitrary ‘channels’ that we should all use, he has sought to understand exactly what the purpose of having the ball is. I am not saying that those channels, zones, and other arbitrary terminology like ‘half-spaces’ are useless, in fact, I use some of those very things. But, I use them based on an objective philosophy of football. They are at the level of application, not philosophy. Those things are not objective. Too many theorists claim those things to be at the level of philosophy, or objectivity. But in reality, those things are subjective, which means they are useful at the level of application, but not at the level of a philosophical approach to football. The objective philosophy of the attacking moment of the game goes as follows. When your team has the ball, the highest order of objectives is to score a goal. When we have the ball, the first thing we should be looking to do is score. If our players cannot score, then they should be looking to make an assist. What if they can’t make an assist? Then, they should pass to someone that can make an assist. It is at this point that we can start to build an objective philosophy of the attacking moment of the game. When a football team has possession of the ball, they should be looking to achieve the following three objectives in order of priority. But, what happens when our team cannot achieve the 3 highest priorities of the game? The action required to score is shooting. The action required to assist is passing. The action required to assist the assist is also passing. Therefore, we know that passing actions precede shooting actions and the eventual objective of the game – to score. 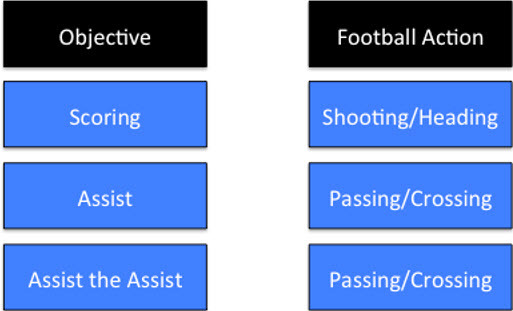 When we break down the passing action, we understand that the best pass is an assist, the second best pass is to assist the assist, and from that point, things can get very subjective. So, let’s take a step back. These are the football actions required to achieve the highest priorities of the game. Based on this, we can now start to determine where to go from here. If we cannot achieve any of these three objectives of the game, then what actions do our players have to make to be able to create the scenarios where we can achieve them? Well, we know that it is easier to achieve a shot on goal when there is only one defender than it is when there are 11 defenders. So, if we cannot achieve those three objectives of the game, then we need to pass the ball, or move the ball, past as many opponents as possible. If we can pass it by 10 players, then we have a much greater chance of achieving the highest order of the game, which is scoring. However, if we only pass the ball by one player on the other team, then it will be much more difficult to achieve the highest order of the game. The reason why these spaces are prioritised the way they are is because of the number of defenders eliminated when the ball moves into each space. For example, space #1, behind the opposition centre backs, eliminates 10 players on the opponent’s team and only leaves the goalkeeper to beat. At this point, it is much easier to achieve the highest priority of the game – scoring. Wait a minute, doesn’t space #2 also eliminate 10 players on the opponent’s team? Yes, of course. But, the space behind the fullbacks of the opponent is farther from the goal than the space behind the center backs of the opponent. For this reason, it is marginally more difficult to achieve the highest priority of the game, to score, from this space as compared to the space #1. In other words, space #1 is better than space #2, and space #3 is better than space #4 because even though they eliminate the same number of players respectively, the goal is in the middle of the field, not the sides. 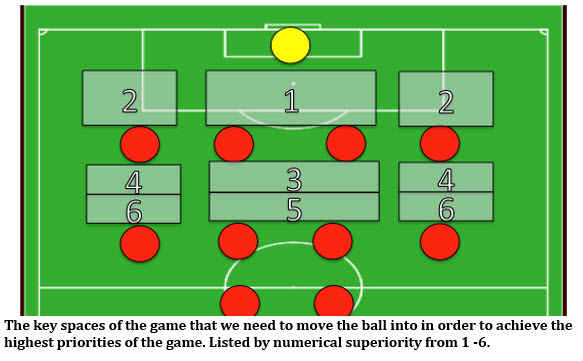 Therefore, those central spaces (#1 & #3) are easier to score from than the spaces in the wide areas of the field (#2 & #4). The opposition is layered in between their midfield and defence, or beyond. Finally, Jed completes the objective philosophy of the game by saying that if we cannot achieve the above three priorities, we must look to play the ball into a new area of the field, retain possession, and with each new pass in the sequence of possession, try to return to the highest orders of the objectives. Based on this objective philosophy, coaches around the world can apply based on their preferred style, methods, and organisations. But, now they will be applying based on something, not nothing. Every coach will have their own preferences as to how they wish to achieve these objectives, but this article is focused on what those objectives are. At this point, you may be saying, especially if you read Jed’s book, “OK great, but we already know this. Weren’t you supposed to be adding something?” Yes. Everything you just read is thoroughly explained in over 250 pages in Jed’s book. What I want to add is the philosophy of defending. Objectively, when you have the ball you are attacking. When you don’t have the ball you are defending. And, the moments between those phases are called transitions. To this point, we have adequately theorized the objectives of the attacking moment of the game. But, what about defending? Well, there are two phases in attacking: building up and scoring. We build up in order to create chances to score. Thus far, we have attempted to objectify the building up phase of the attacking moment. When we are building up we are trying to achieve the objectives of the game by moving the ball, and ourselves, to achieve the highest priorities of the game: scoring, assisting, and assisting the assisting, and so on. This has already been extensively covered in the previous paragraphs, but repetition is always a good thing to create understanding. When we don’t have the ball we are defending. Defending is the counter to attacking. So, when we don’t have the ball we are disrupting the build up of the opponent and preventing scoring. Those are the two phases that make up defending. So, we know that in football, when we have the ball we are attacking. When we attack we are building up and scoring. We know that when we are building up we are trying to achieve the priorities of the game detailed earlier. Scoring is the highest priority and main objective of building up. We also know that when we don’t have the ball we are defending. When we defend we are disrupting build up and preventing scoring. But, the question is what is the objective way to do that? Every coach has a subjective application of defending; a preference as to how they would like to defend, but what is the objective philosophy of defending? Let’s take a look at the objective organisation of football again. This allows us to see something fairly important. Attacking and defending are polar opposites of one another. Like multiplication and division, or addition and subtraction, one is the counter to the other. Fortunately, Jed objectified building up and scoring for us. This leads us to the next logical objective of the game – the objective philosophy of disrupting the build up and preventing scoring. 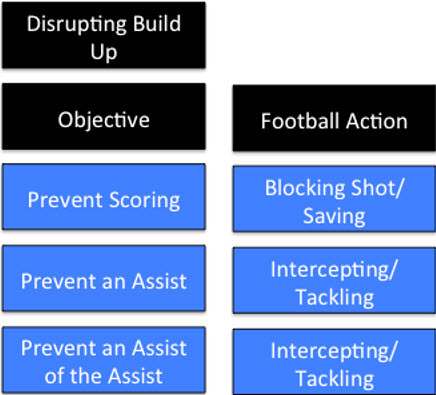 We can see clearly that the objective philosophy of defending (disrupting build up) exists as the counter to the objective philosophy of attacking (building up). We achieve these objectives and priorities through football actions just like we do in the attacking moment of the game. Here you can see the objective football actions that allow us to achieve the priorities of defending. I hope you understand that I have listed a few examples of football actions, but note that this list is not exhaustive. There are other football actions that can prevent scoring, prevent an assist, etc. If a team cannot achieve the three highest priorities of building up, then they will look to move the ball into the key spaces discussed earlier. Therefore, the objective philosophy of defending and disrupting build up is to make football actions that counter those of the team in possession. When the attacking team cannot score, assist, or assist the assist, then we want to deny the ball from moving into the following spaces. Creating layers between our midfield and defence (or beyond). At this point, the objective reference of disrupting the build-up is complete. It is at this point that coaches should begin dipping into the level of application. In other words, how do they want to go about achieving the objective priorities of defending? For some of you, these objectives may seem unnecessary. Why do we need all of this theory? I know that I want my team to be compact, so what? And that is exactly the point. Earlier in this article I explained how most coaches simply just apply. I want my team to press! But, why? I want to use positional play! But, why? Most of the time, the reasons are either subjective, or nonsensical. Coaches may say things like, “I don’t want the opponent to be able to breathe!” OK, great, but what the hell does that mean and why do you want that? Or, “I want to have possession of the ball.” Yes, of course. But, what do you want to do with that possession? The coaches that know why and what will beat the coaches that know how. A lot of coaches know how to teach a pressing coordination, but do they know why they are pressing. Do their players know why they are pressing? Do they know which priority of disrupting the opponent’s build-up pressing helps them achieve? Maybe they do. And if so, that’s great! But, many coaches don’t. Many coaches subjectively apply the organisation of their team based on the newest trends, latest articles and books, or most popular managers. I hope by this point that you understand that those things are completely subjective. They are all at the level of application. Reading Pep Confidential is great, but I hope you understand it is entirely subjective. It is his application of something. Without understanding what that something is that he is applying from, you end up subjectively applying someone else’s subjectivity. Subjectively applying someone else’s subjectivity results in chaos. Pep, Mourinho, Bielsa are all subjectively applying from objectivity, or at least I would hope that they are. They understand the objective characteristics of football. So, if we take their subjective application as objective, we are going to be severely miscalculated. You see, objective philosophy helps coaches become better at the level of application. In that sense, it may be the most important part of football. With objective characteristics of the game spelt out and understood, we can now read articles, books, and watch interviews through a whole new light. How does what Thomas Tuchel just said relate to the objective of attacking and building up? Why is he organising his team that way? Oh, he wants to try and move the ball into the space in front of the opposition centre backs to create chances. And, he is doing that because the opponent is spread out vertically. Now, you can theorise whether or not that applies to you, your team, your competition, and your league. What would happen if you subjectively applied someone else’s subjectivity? Well, what if every team in your league is vertically compact and you show up to the field one day and start preparing your team to play into the spaces in front of the centre backs. “Hey guys, Thomas Tuchel plays this way! It must be good!” And then the result is an absolute trainwreck. But, if you objectify Tuchel’s subjectivity, you can learn a hell of a lot more about football. You will know why he is doing what he is doing. You will understand what he is trying to accomplish from an objective standpoint. And from that standpoint, you will have a better understanding of how you may, or may not apply it. OK, now that we understand the importance of objectivity, let’s see the objective reference in its entirety. You will probably note that I made one change to Jed’s objective model. While I acknowledge that the purpose and highest priority of building up is to score, by definition, if you are scoring you are no longer building up. Therefore, I didn’t include scoring underneath building-up. The final moment of the build-up is the assist. Similarly, the final moment of disrupting the build-up is preventing the assist. 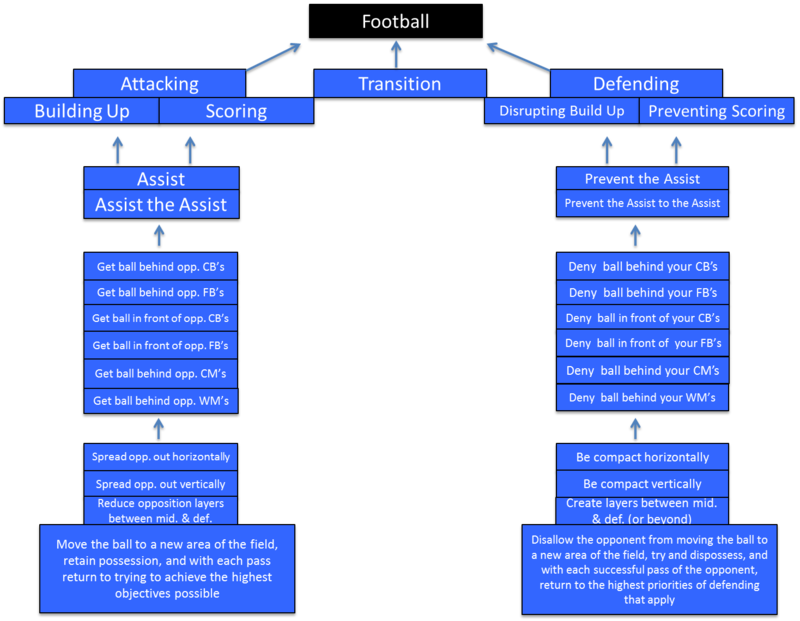 Once the assist is being made, the phase of defending switches to preventing scoring by making football actions that achieve that (tackling, intercepting, blocking, saving (GK), punching the ball (GK), tipping the ball (GK), etc.). In addition, the final objective of defending is quite interesting. When your team is attacking, the last objective is to move the ball into a new area of the field, often called ‘switching the play’, in order to create a new angle at which the team can achieve the higher priorities of attacking. The attacking team will also want to retain possession during this moment. Therefore, the last objective of defending is to disallow the opponent from moving the ball to a new area of the field, or switch the play, and subsequently, try and dispossess the opponent of the ball. Finally, if the opponent is successful in retaining possession; with each successful pass the opponent makes, the defending team returns to the highest priorities of defending applicable. It is important to note that these priorities are not sequential. They are, in fact, consequential. In other words, they don’t follow a logical order. By that, I mean that we don’t have to move the ball behind the opposition centre backs to be able to score a goal. That is why with each new pass, the players should return to the highest priorities of the game and move down from there to find what they can, or need to, execute in the moment to be able to achieve the higher priorities. For example, the first thing you may have to do defensively is get compact horizontally and vertically to deny the opponent from achieving the highest priorities of attacking. Although those priorities of defending are lower down the objective list, your team may need to ‘jump’ to those priorities based on where the ball and the opponent is. However, that is all at the level of application. That is for you, as the coach, to determine. Another example to aid in the understanding of the consequential nature of these objectives was when David Beckham scored from the half-way line against Wimbledon. Beckham was in the space in front of the opposition fullback and 60 meters from the goal. However, his cognitive process immediately asked if he could score from where he was and he made the decision to do so. Therefore, it was a consequential decision. It was a result of perceiving the environment, seeing the goalkeeper off of his line, and ‘jumping’ to the highest priority of the game – scoring. In other words, these objective priorities of attacking and defending are not logical progressions from one to the other. You don’t need to reduce the opposition layers, then spread them out vertically, and then horizontally, etc. No, the purpose is to always be seeking the highest priority possible. If it is not possible, then we want to achieve the next best priority available and so on, and so forth. This objective philosophy is to be used by you to apply based on the logical structure and characteristics of the game. But, these are objective. You cannot deny that it is easier to score against 1 defender (ball in behind the opposition centre backs) than it is to score against 11 defenders (ball in front of the opposition forwards). You also cannot deny that the purpose of attacking and building up is to score. The purpose of defending and disrupting the build-up is to prevent scoring. From there, the remaining priorities are the logical consequence of the previous priority. But, football is not logical, or sequential. So, these priorities will help you, as a coach, use your knowledge and experience to determine how you want to go about achieving the highest priorities and how you want your team to behave when they can’t achieve the highest priorities. Using this objective reference, coaches can now successfully move to the level of application and determine how they think their team should organise themselves in order to achieve the priorities and objectives of building up and disrupting the buildup. With a philosophical starting point, it is now possible to subjectively apply objectivity.